For a microdisk electrode, the region of interest in the simulation domain is a few times larger than the microelectrode dimension (ca 10 μm). The typical electrochemical cell dimension is about 5 cm, where the far-field boundary conditions for bulk concentration are applicable. This far boundary is thus 5000 times larger than the region of interest, and simulating such a large domain is not very accurate; consequently, the far-field distance is often truncated. The accuracy of the simulated current in the microelectrode depends on how much the far-field boundary conditions are truncated. This Demonstration addresses the question: is the simulation domain large enough to get a satisfactory result? The simulation box represents the electrochemical cell containing the microelectrode with dimension 1 unit (situated at the bottom left of the box, between and ). The far-field boundaries represent the limit of the electrochemical cell where the bulk concentrations apply. 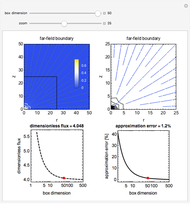 Simulation in a large domain is time consuming, so the far-field distance is often truncated. However, the accuracy of the simulated current (or flux) depends on the extent of truncation of the far-field boundary conditions. The top-left figure shows the stream plot of the redox species flux. At the surface of the microelectrode, the electroactive species is consumed, thus the flux is highest (colored red). Far from the microelectrode, the concentration of the electroactive species is constant, and the flux is zero (colored blue). You can zoom into the small area, which is shown in the top-right figure. The flux on the contour line has the same value, which shows that the flux is enhanced at the edge of the microelectrode (at ). This is called the "edge effect". The top-right figure shows the zoomed region (black rectangle) in the top-left figure. 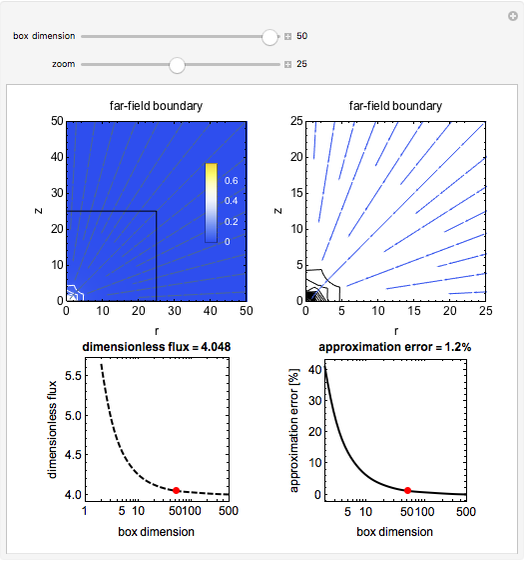 The bottom-left figure shows the flux calculated for different box dimensions. When the simulation box dimension is not large enough, the flux obtained is higher than the expected value (the correct value is 4). The calculated flux approaches the limit value of 4 as the box dimension is increased. 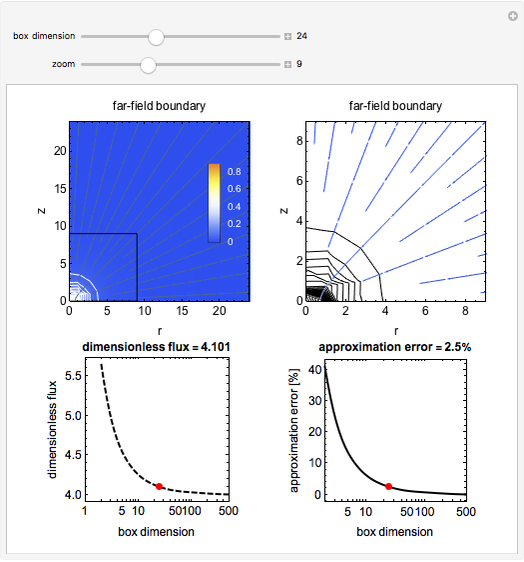 The bottom-right figure shows the relative error between the simulated flux and the exact solution . The accuracy of the simulation model depends strongly on the simulation box dimension. If the simulation dimension is 10 times larger than the microelectrode size, the relative error (about 6.2%) is not good enough. 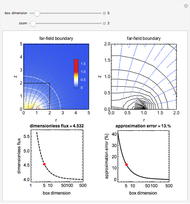 The standard acceptable error in the simulated flux, when comparing with experimental errors, is 1%. To achieve this relative error, the minimum simulation box dimension required is 62 times larger than the microelectrode size. Even for a very large simulation domain of 500, the accuracy of the simulation model is about 0.12%. 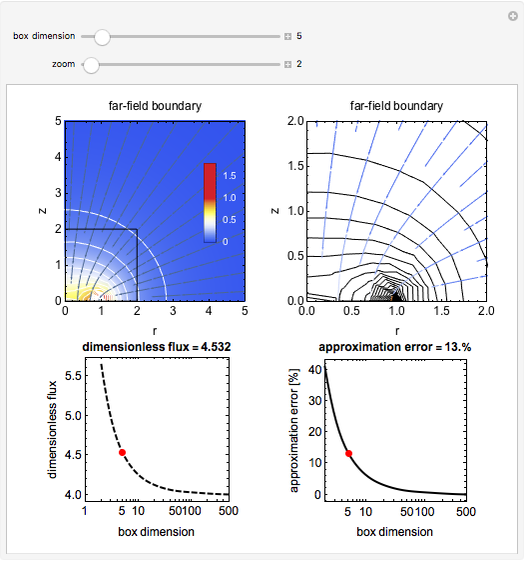 In this Demonstration of a model for steady-state diffusion at the microelectrode, the simulation box dimension can be varied in order to achieve a desired level of accuracy. D. Trinh and S. Touzain, "Numerical Simulation of the Far-Field Boundaries onto a Microdisc Electrode by Using the Infinite Element," Journal of Electroanalytical Chemistry, 729, 2014 pp. 1–8. doi:10.1016/j.jelechem.2014.06.027. Quang-Dao Trinh "Simulation Domain for a Microelectrode: Is It Large Enough?"